When you read the title of the post, you probably thought I was going to try to sell you some kind of new training equipment out on the market when. 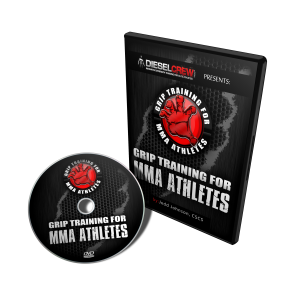 If you want a truly strong grip, there is one thing you need to have that you might not be doing in your training. I know for a long time when I first started, I left this out, and because of it, my numbers suffered. Since then, I no longer make that mistake, because I keep this in my training on a regular basis now. No, it’s not a special piece of equipment. If you want a strong grip, you NEED strong wrists. Many of the muscles that control your grip run through your wrist. So, all the power is running right through that joint. If you’ve got good wrist strength, that power will pass through well. If you neglect your wrists, they’ll stay weak, and that means you’ll never reach your potential with your hand strength. If you don’t have good stability there, you’re SCREWED. So, the question is, how do you train for wrist strength? One way is with Sledge Hammer Levering. Sledge Hammer Levering involves gripping a sledge by the handle and then lifting the head up and down, under control, using wrist strength. Chances are you already have a Sledge Hammer. If you don’t you can use any type of leverage device. A mop or mop handle will work great. Even a baseball bat can do the trick. Remember, your objective is to work against leverage through a variety of angles, in order to make the wrists as strong as possible. Because if you don’t have strong wrists, there’s virtually NO WAY you can have a strong grip. If you want ideas on how to build wrist strength, check this out: Lever Bigger Hammers. There have been many great Strongman Performers in the past, that it is impossible to point to all of them and the amazing feats of strength they accomplished. One of the all-time greats that is still a living legend is Slim the Hammer Man Farman. 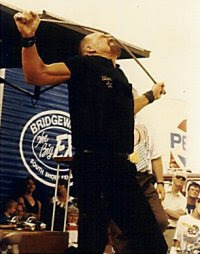 Slim Farman is called the Hammer Man because of his prowess with Sledgehammers. They are his trademark and he has done some things with Sledges that most likely will never be duplicated. The Story of Slim the Hammer Man is a long one, but in a nutshell, he worked in stone quarries with sledgehammers from a very young age. During his youth, he would often watch the Mighty Atom perform his strength act. Eventually the two interacted during one of the shows and a simple challenge turned into a friendship that lasted years and years. The Mighty Atom took Slim under his wing and coached him to be a professional strongman performer. The Mighty Atom has long since passed, but the Hammer Man is still alive today. I first met Slim when he traveled from his home in PA to the location of the Global Grip Challenge, 2007. I also was in attendance when York Barbell inducted Slim into their museum, last year. I wrote about that trip and posted videos here: Slim Farman Inducted into York Barbell Museum. Slim has also taken on a position of a mentor for many of my colleagues in the area of Strongmanism, such as Dennis Rogers, Chris Rider, and David Whitley. Although I have never had the occasion to sit and train or be coached directly by Slim, I still marvel at some of the feats he has accomplished. One of the feats he is famous for has been labeled, The Slim Lever, and is sometimes contested in Grip Contests, especially in medley events. It can be done with one signle sledgehammer or with two sledgehammers that are bolted together. I do not know the weights that Slim Farman has done with this sort of set-up, but I am sure it is way more than I have done. 1. The Sledgehammer starts out with the head positioned vertically and the handle nearly parallel with the ground. 2. A small pad can be used to cushion the knuckles. A wash towel should work perfectly. 3. From there, the hand is placed at the end of the handle and the hammer head is raised with wrist strength until the handle is vertical, then the hammer head is returned to the ground. You can see an actual picture of Slim performing this lift, above. That hammer there looks to be a 20-lber with a pin attached that allows for even more weight to be added – SCARY! Recently, I was training with my friend, Kyle Kintner, and I showed him this maneuver and for the first time I was able to hit 16-lbs. The video is below. With this feat being this close, I just HAVE to try it some more in the next few weeks. This would be a feat that would blow away anything I have ever done, and it would be something that I would be very proud of accomplishing. To be this close to it also tells me that the other limited stuff I have been doing for wrist strength has been helpful, even though it has not been a major factor in my training. I will keep you posted. Until then, keep training hard on your goals as well. 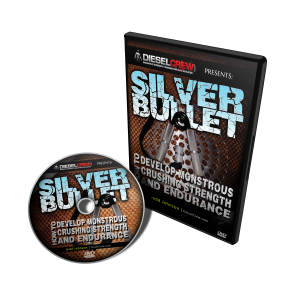 Want more Sledgehammer Training Ideas? Check out the Nail Bending eBook. The World Renowned Nail Bending eBook is loaded with sledgehammer training methods that will build your wrist strength like no other form of training can. Click the image below. “I bought Jedd’s E-book because I was interested in steel bending but didn’t have the knowledge to start out on my own. I had no clue about the many types of metal stock, steel bolts, nails, how to wrap…I could go on and on. This book taught me so much in one day, I was blown away. No stone was left unturned. This E-book brings a wealth of information to the table and is worth every penny and more. 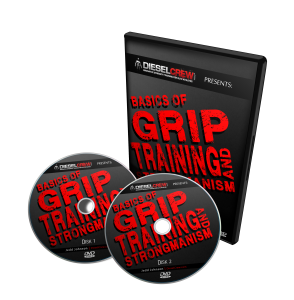 It has instructional pictures, terminology, techniques and exercises that no one but the Diesel Crew could possibly come up with. It is all done in a very clear and concise manner that anyone can follow. Thank you Jedd. What are you working on? How can I help you out? Thoughts on this post?